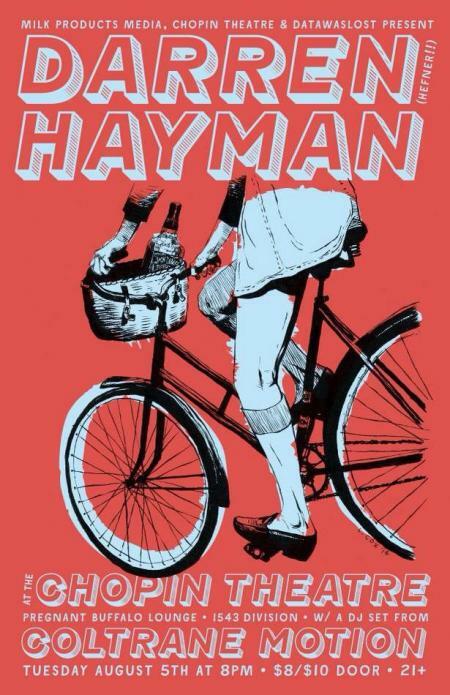 Tuesday August 5th at 8p - Darren Hayman, prolific singer-songwriter best known for British indie pop heroes Hefner, performs intimate show in Pregnant Buffalo Lounge of Chopin Theatre. First Chicago Show in 15 years. Coltrane Motion opens. In their relatively brief lifetime, between 1996 and 2002, Hefner enjoyed an incredibly productive four-album, multi-EP career. Their beautiful, concise, intelligent songs earned a fiercely loyal, cult audience and the long-term support of legendary DJ John Peel, for whom they recorded innumerable sessions. Darren Hayman is an Essex-born singer, songwriter, and guitarist. Since Hefner he has remained prolific, releasing solo albums that veer from straight forward folk to synth-pop, such as The Violence (about the Essex witch trials), The Ship’s Piano (a collection of piano ballads), and January Songs (Darren’s project of writing and recording a song every day in January 2012).